There are two search engines. Here is a picture of the search results after using the native search engine found on the top of every page. The custom search engine allows you to chose what databases to search. For instance, you can pick “Federal” to only search the Federal databases (all of them) or you can drill down and only search the OCR database (for instance). Or limit to BSEA decisions. This search engine does not allow phrases, it searches for single words. So putting in “summer school” will return entries with “summer” and “school” but not necessarily together. It will very often give you what you are looking for, and is worth trying first. 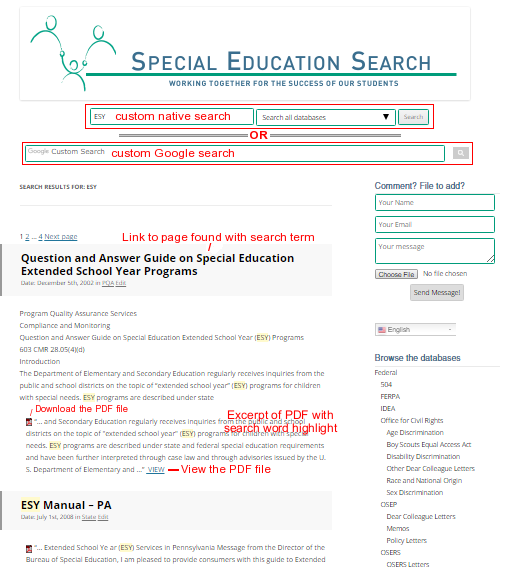 The custom search will search inside pdf and Word files (both are on the site). You can use the “view” link to see a pdf file before downloading it. Also remember, any page (on any site) can be searched by hitting cntrl-f (hold down the “ctrl” key and hit the “f” key). A search window will show, this is useful when looking at documents. The Google custom search will always search all the databases on this site. At times it will return some ads as the first results in a separately defined area. I have no control of that part, nor do I make any money from it. You can use it as you use Google, with phrases in quotes, etc.